I came up with this idea a while back but didn't know how or when I would implement it. As time passed the idea went into my book along with all my other crazy ideas. 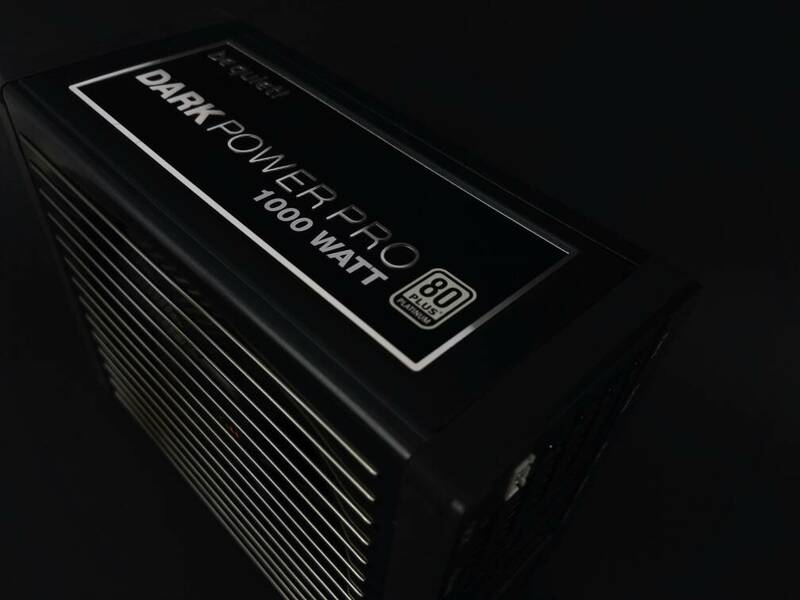 After looking at some Be Quiet products on their site I came across the Silent Base 800. The bottom “skids” or feet were perfect! Exactly what I had been looking for. 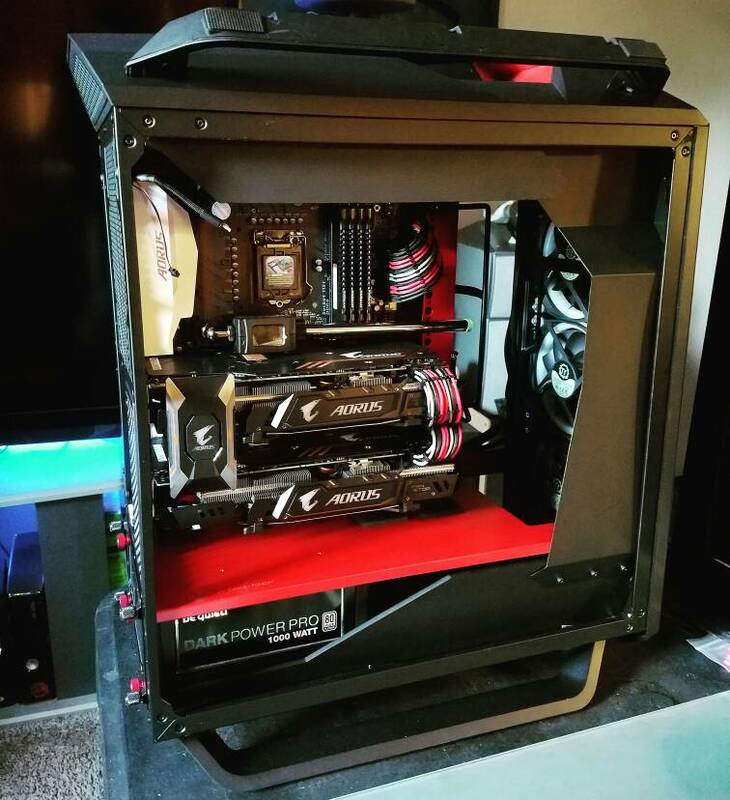 After exploring the idea further and taking some more looks at the Cooler Master MasterCase 5t; I realized it was the perfect candidate. 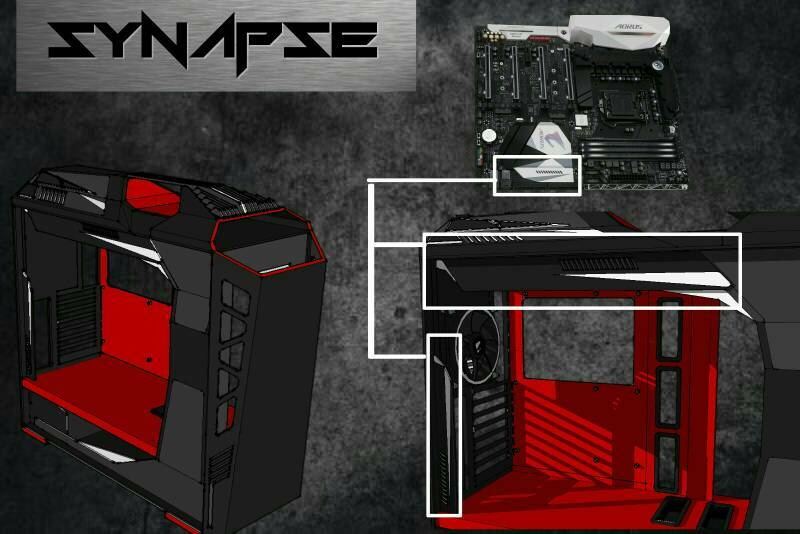 My idea was to make it look like the MasterCase 5t and the Cosmos had a love child and named it, “SyNAPSE.” it couldn't have come together any better. Combining those designs cues with the ones found on the hardware and I have a complete build that is something I would want to own but doesn't exist. 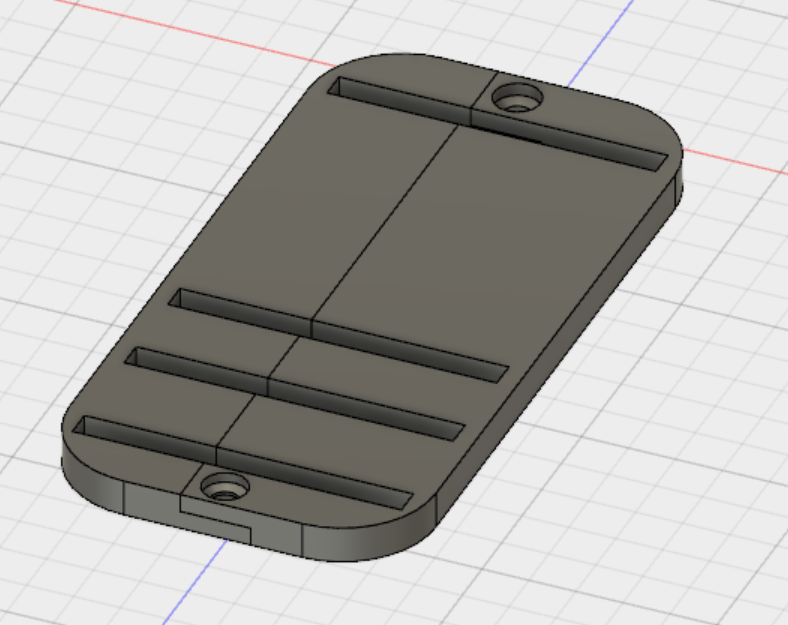 It will be an uphill challenge as mounting brackets will have to be custom made and more than likely 3D printed. Less than a week ago I saw the Cosmos 700 prototype and they ventured from the round skids or feet for ones that were more like the ones I will be using. This made the SyNAPSE build even better. 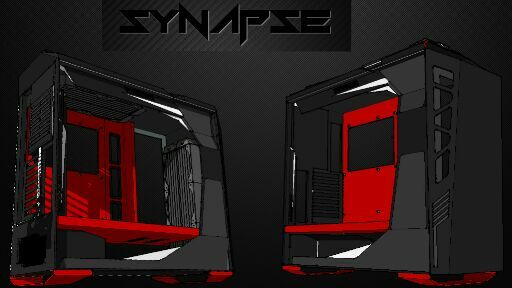 I've named this build SyNAPSE as it will bridge the gap between organic and mechanical. Sharing a lot of design styling from Gundam and other off shoots. 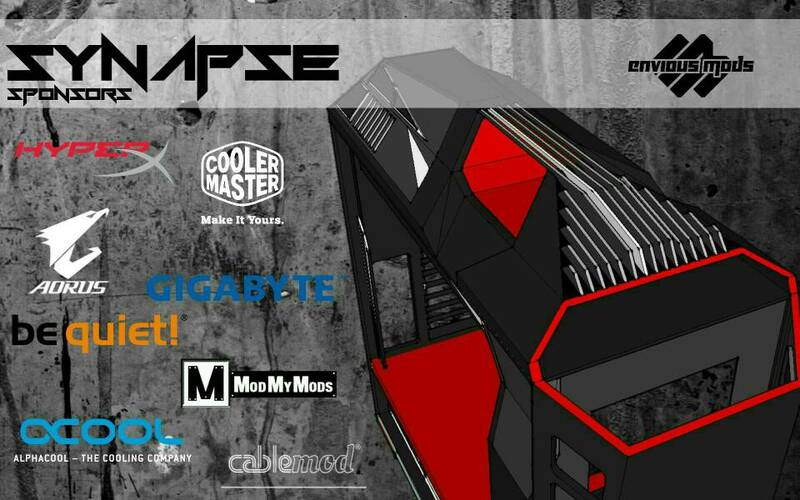 The SyNAPSE case mod will be heavily inspired by Gundam. All of the popular movies and games we see on a daily basis were born from the original, "Mobile Suit Gundam." This dates back to the early 70s and has been a mainstay in Asia ever since. Gundam consists of the futuristic mech robots that have been adapted into a lot of different platforms. It has evolved into an extremely popular line of games, tv shows and movies. I want to go back to the roots of Gundam and adapt it to current day perspectives while focusing on the designs found throughout the hardware being used in the build. The combination will make this build one of the most cohesive builds I've ever done. 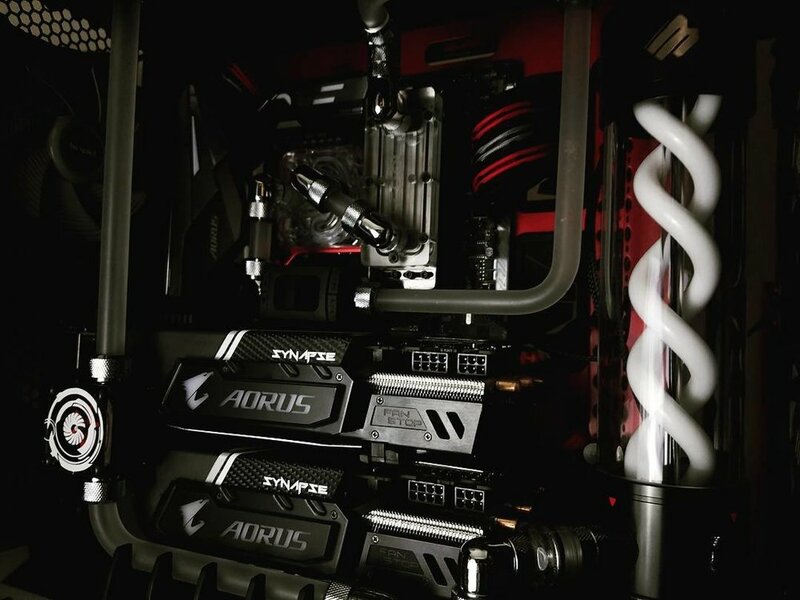 Every detail from the hardware will be carried over into the rest of the build. 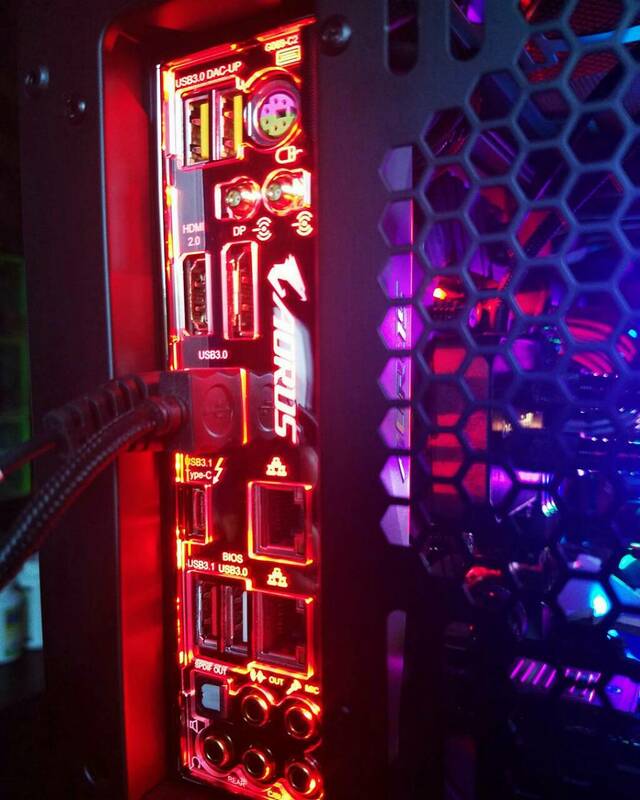 LED Strips: CableMod RGB/W dual wide angle LEDs that work with Gigabytes RGB Fusion controllers. 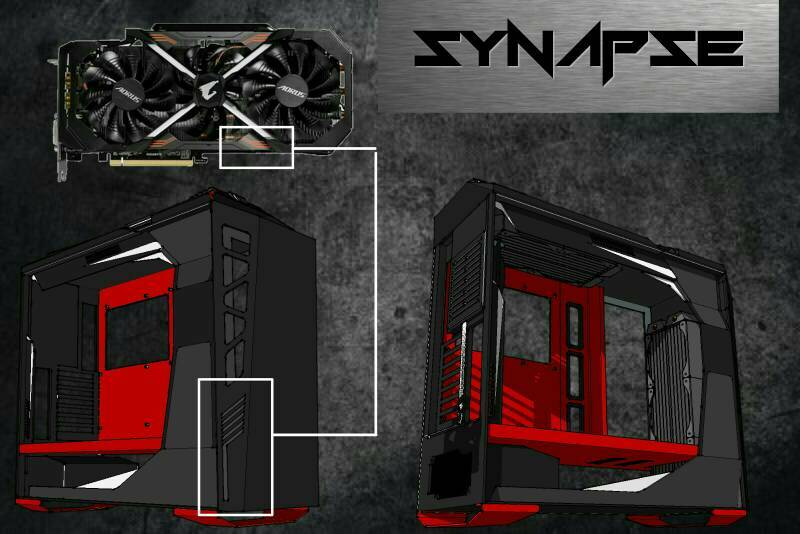 The concept art shows the basic path I will be taking with this build. I've since added a few features that will really take this build to the next level. 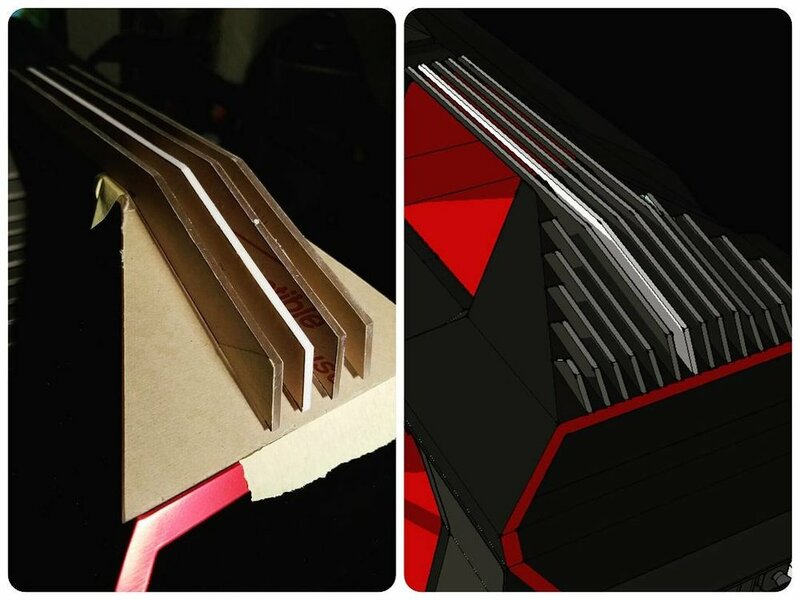 I started out by taking some of the designs done in the concept art CAD design and made a full scale mock up templates. This helps assure everything will fit as intended. Usually I use hard stock paper as many of you may know. This time I wanted something a little more rigid so I bought some trifold boards from the dollar store. 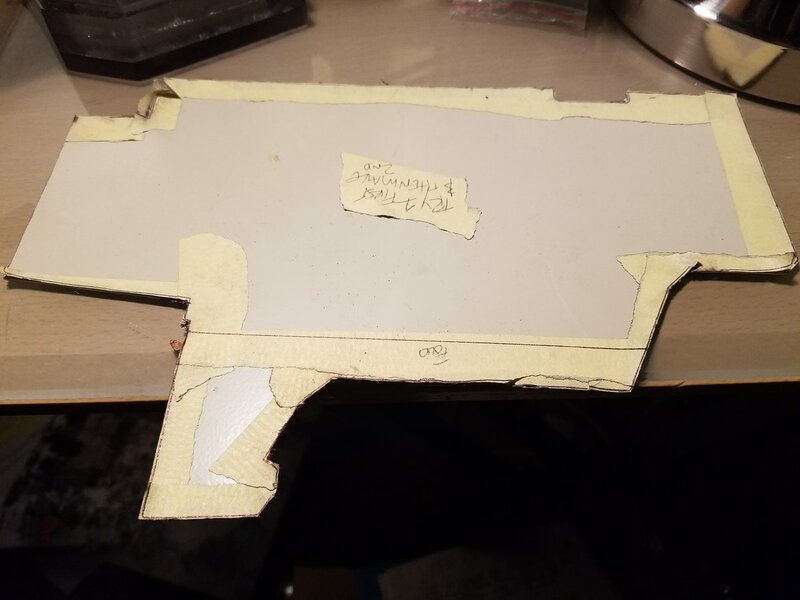 It's a type of cardboard but different then the type of cardboard you may be used to. It works great for mocking up shrouds. I decided to make the full shroud in 3 separate pieces. Breaking the shroud up helps with installation and future maintenance. 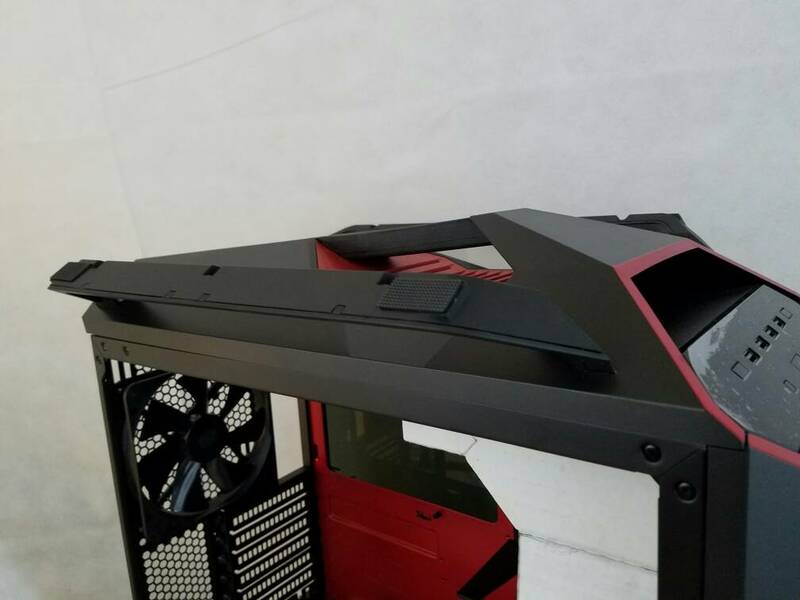 The top horizontal piece will be mounted a lot closer to the side of the case which will give it a lot more depth. Thanks Mos and me too! It took a lot of measurements and head scratching to figure out how I would mount the top and bottom ones. I decided to take the most challenging one 1st which was the top set. Luckily the two pieces where the skids would mount are at the same angle which made the task a but easier. Now that I have them mocked up, I can fine tune the angle that they come out of the case at. I haven't decided if I want them perfectly flat facing upwards or at a slight angle. I will more than likely wait until the bottom set is on so that I can see it both ways. Now that I have the top all mocked up I can do the bottom set. I used the measurements from the top to locate where I should mount the bottom set which assures they will match up. I had to remove both of the stock feet from the MasterCase 5t. They come out really easily after removing a couple bolts and unlock by sliding them. I've been debating on modifying the stock feet so that they can be remounted with the new skids. I will probably wait until I have the skids exactly how I want them before playing around with them. As you can see the bottom skids fit perfectly. There's a decent amount of work into getting them in but it's already paying off. 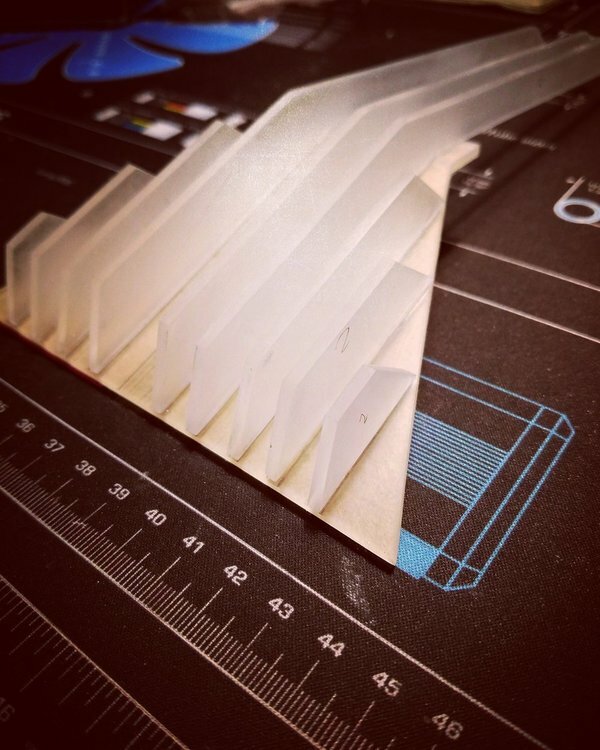 The next task on the agenda is taking all of the templates made and turning them into actual parts for the build. Getting to this stage takes a little bit of work but once you're there goes along pretty easily. I use the templates to trace out cut paths in either acrylics or different metals depending on the use. For this side pieces I will use a combination of both for different reasons. These panels will all be at different angles and mounted in different positions. Typically I'm out most the stuff in one plain we're on this build they will be mounted in all different planes and positions. This will give it a lot more depth as it will be three dimensional versus flat surfaces. Painting panels is pretty straightforward for the most part. Everybody seems to have their own way of doing things that works best for them. For these pieces I first started by lightly sanding or roughing them up so that the primer will stick to it better. With the acrylic primer is very important. 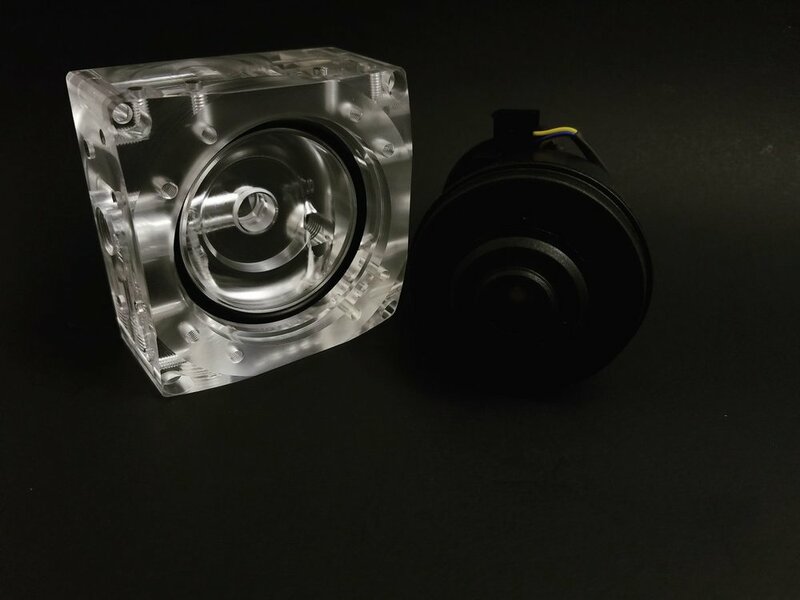 The reason it is so important is the LED lighting inside the case will show through the clear panels even after they're painted, without the use of primer. So it's important to get a good thick base of primer before your color coat goes on. Doing so will help ensure that you get no bleed through from the LED lighting. For right now I will just leave them in primer which will allow me to wait until I'm done with the rough work. I recently got a Be Quiet 240mm AIO so that I can test all the hardware and configure everything at the start of the build vs when it's finished. This had dome big advantages. It allows me to make sure there's no issues with the hardware and design the build with the configurable leds in mind. I had to also install an OS so that I can configure the fans as well. I will be using a combination of ring plus and Silent Wings 3 fans. The Ring Fans will give me some of the aesthetic look I'm going for while the Silent Wings 3s will do the intake and exhaust work. 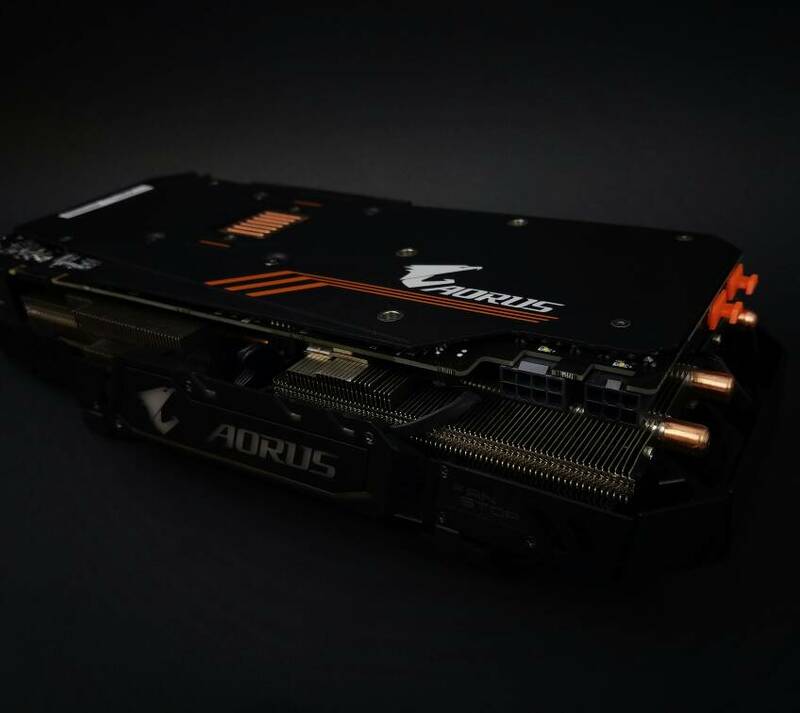 The Aorus motherboard, graphics cards and SLI Bridge are all configurable and offer multi-zone lighting. This allows me to controller everything through the motherboard and set different leds up in different ways. The ring fans have their own app and can be controlled by my cell phone. 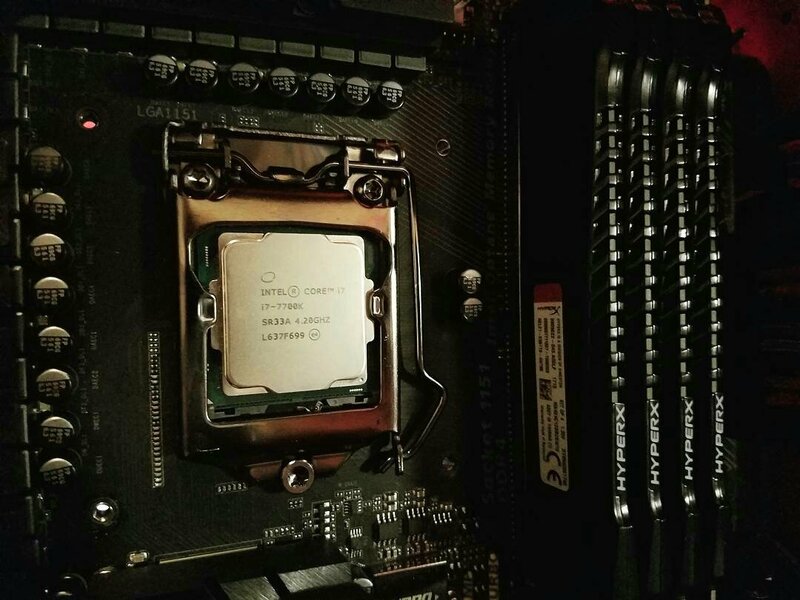 Installing the i7 7700k is pretty straight forward. As mentioned I'm using the Be Quiet 240mm AIO so that I can test and configure the hardware. I haven't got the RGB Fusion software setup yet but, I have played with it before. 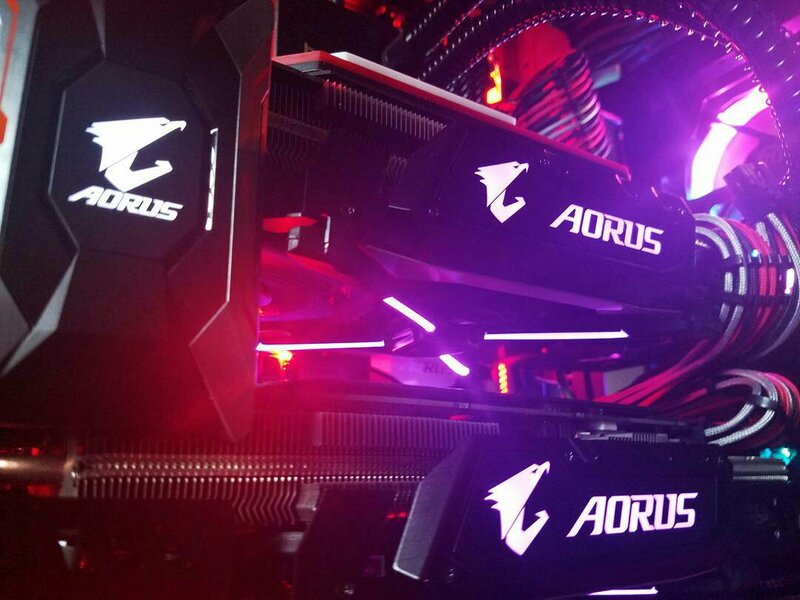 The options for this motherboards RGB LEDs is awesome. 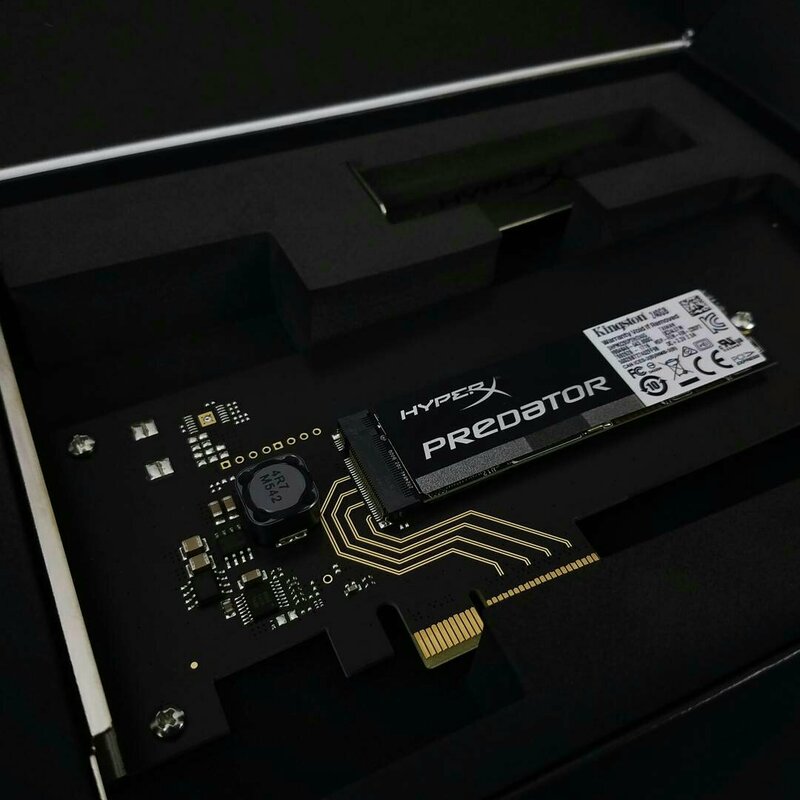 Not only can you control each section of the motherboards LEDs individually but you can set them to do different functions. You can have them flash, pulse or cycle different colors. It also let's you select what colors you want them to cycle as well as how long each color shows. Another cool feature is to set the LEDs in real time to tell you CPU Temps or CPU loads as well as other features like fan speed. Once I'm able to install the rest of the software I will post some pics and explain RGB Fusion in more detail. I will also be using CableMod RGB Fusion leds that are RGBW. 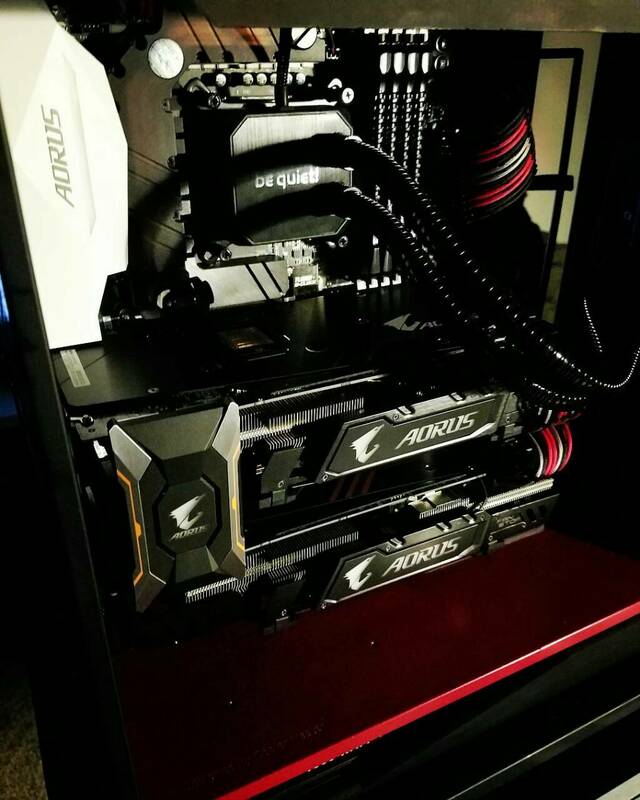 These cable strips include a set of RGB LEDs and next to them a strip of white LEDs so that you get a true white and not a off-white. 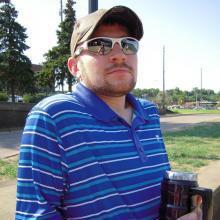 Looking great man following for sure. Thanks buddy I really appreciate it. Sorry for the lack of updates recently but I've had issues with Taptalk not working so now I'm doing it a different way. 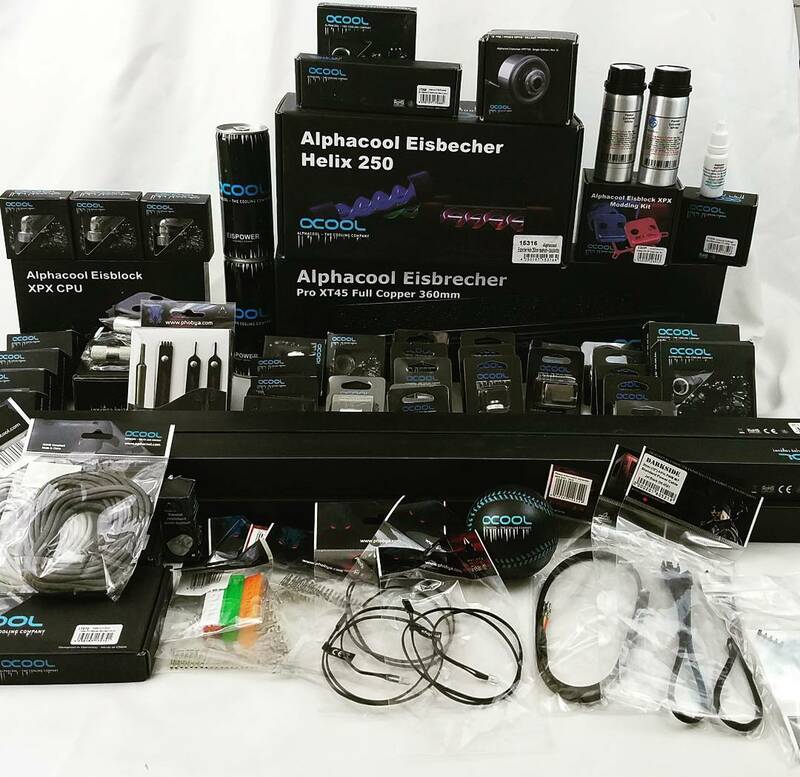 All the sweet watercooling gear is on its way to the shop so it'll be here soon! 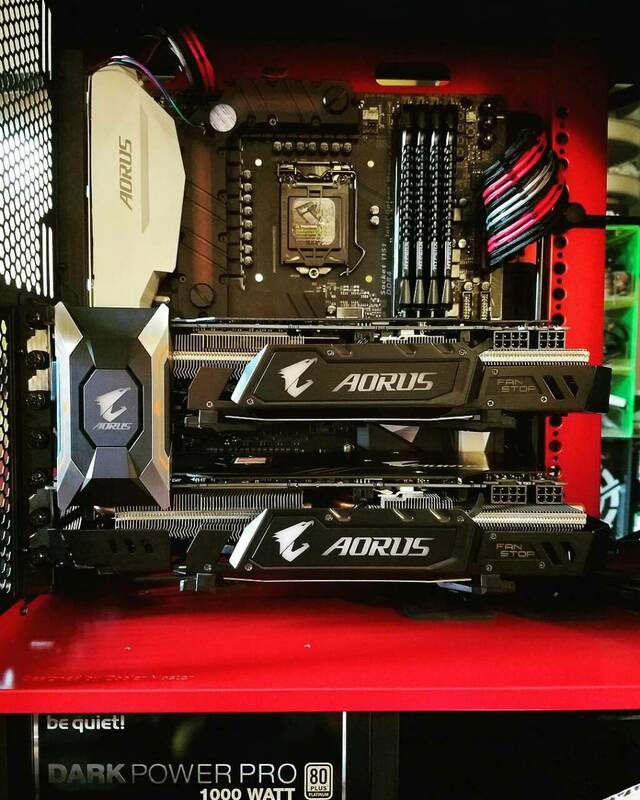 I wanted both of the power cables coming from the graphics cards to go in between both of them. Usually people have each set go under the power supply it's connected to. I thought I would look even better to have them both go in between each other so the top one would go down and the bottom ones would go up. The problem with doing this is the cables don't want to naturally go this direction without deflecting to the side. After talking with a few friends of mine Jake and I came up with a rough concept for a comb that could be applied without de-pining the cables. Since I don't have a CNC in order to mill these intricate pieces, my friend Jim is going to mill some prototypes for me to see how they work. 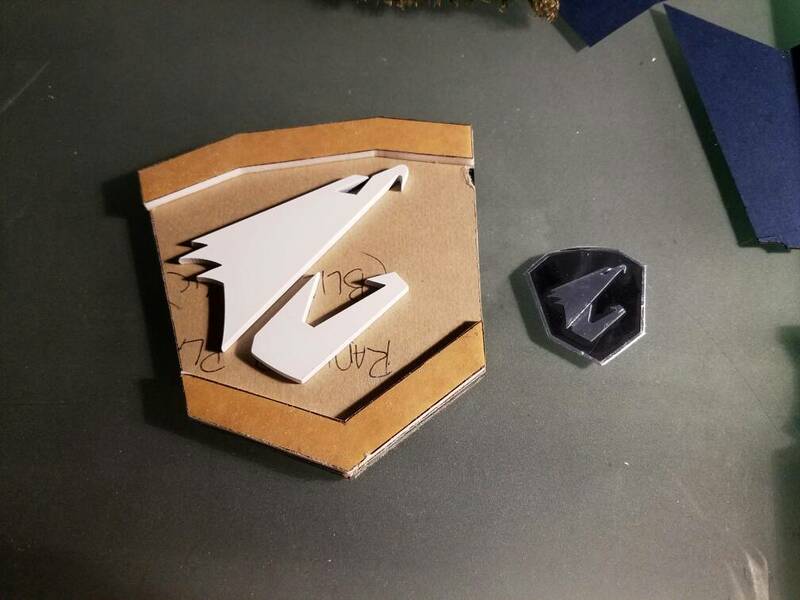 Below is the basic design of what they will look like put together by Jake. 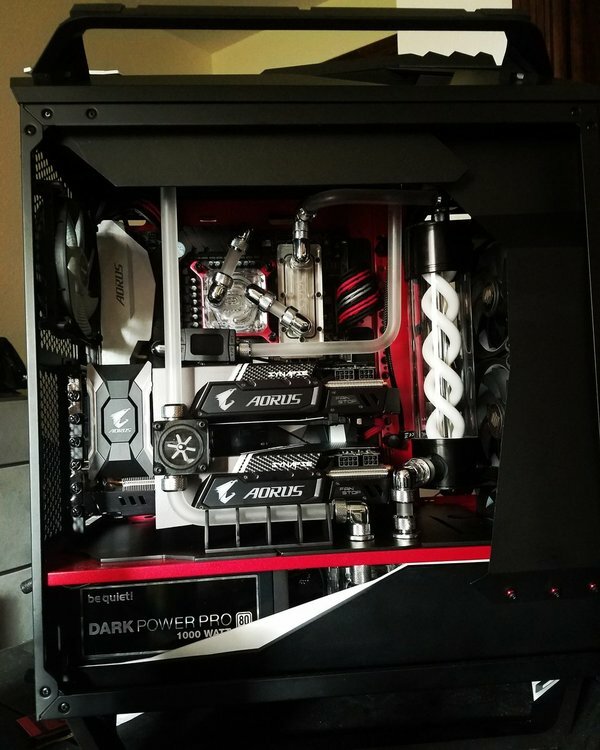 I usually wait til the build is finished but I wanted to fine tune every aspect of this build so I decided to install everything and further configure it. This also gives me a chance to show you all the cool stuff the Aorus software can do on the Z270X-Gaming 9 motherboard, Aorus GPUS, sli bridge and Thermaltake Ring Plus fans. 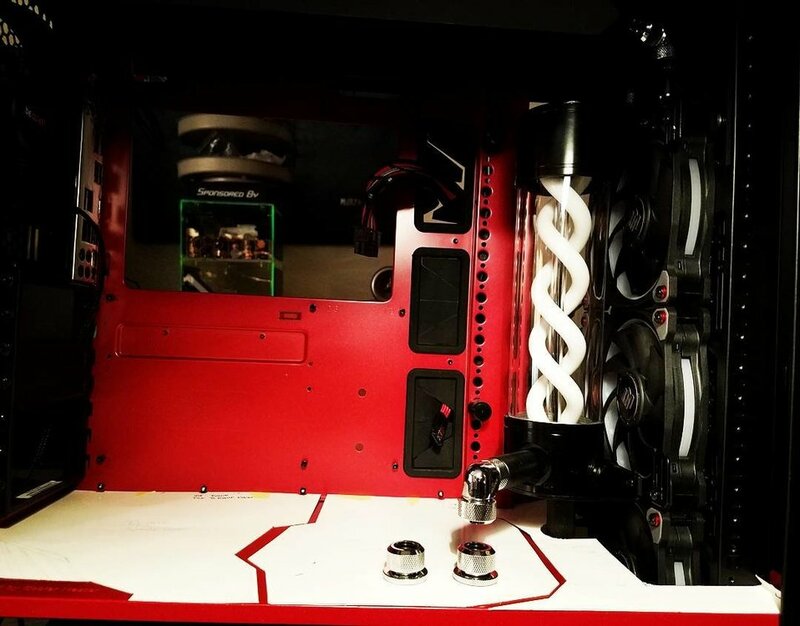 The SyNAPSE case mod has been on hold until the last few parts arrived which consists of all the awesome watercooling. I was lucky enough to snag one of the brand new Helix reservoirs that just came out as well as a bunch of other new things. Alphacool came out with some new fittings that are essentially adaptors and fittings combined. I really enjoy this because it keeps you from having to use a bunch of different parts which looks much cleaner. I've taken some pics of the main stuff supplied and the rest will be pictured as it's used. 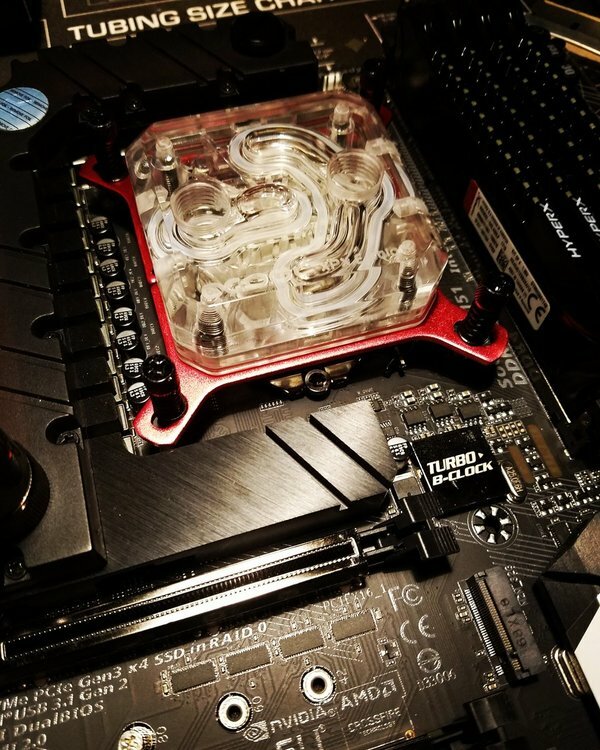 I decided to start out by putting the Eisblock XPX CPU Cooler together. 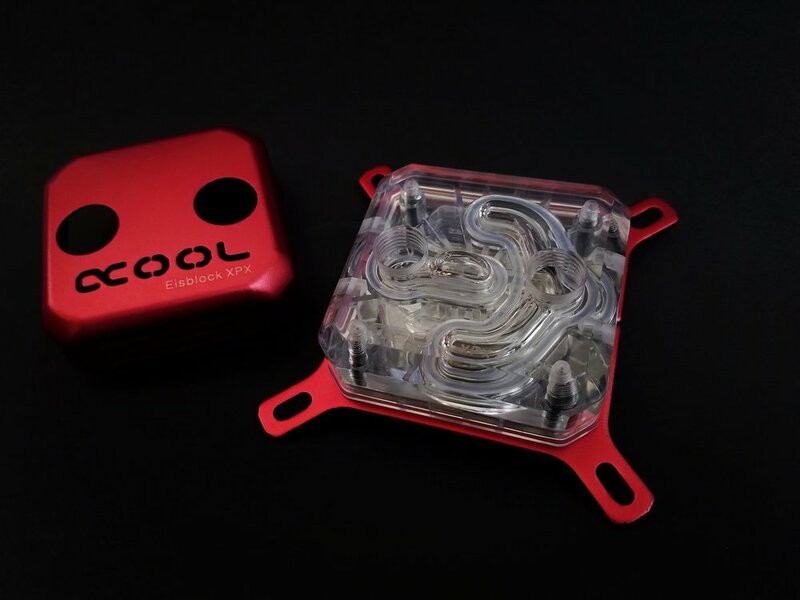 I ordered the red color change kit from ModMyMods which will match the build perfectly. 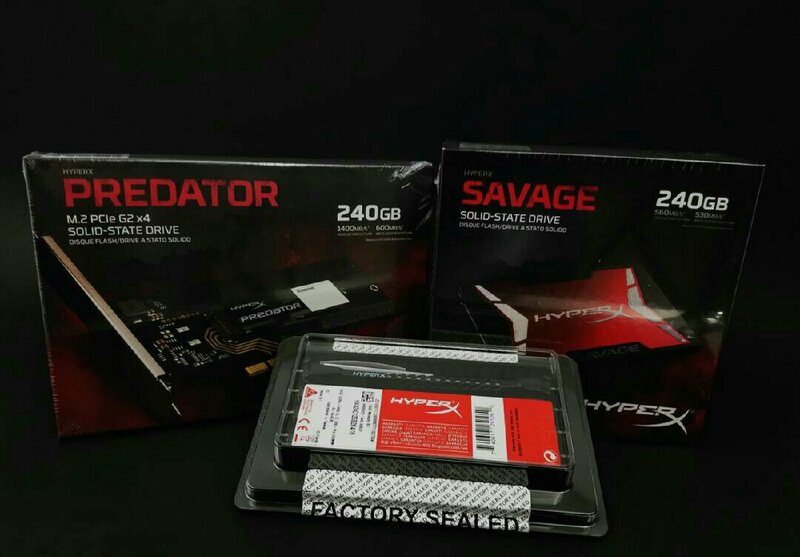 I also decided to try something different with the HyperX Savage DDR4 RAM and fully watercool it. 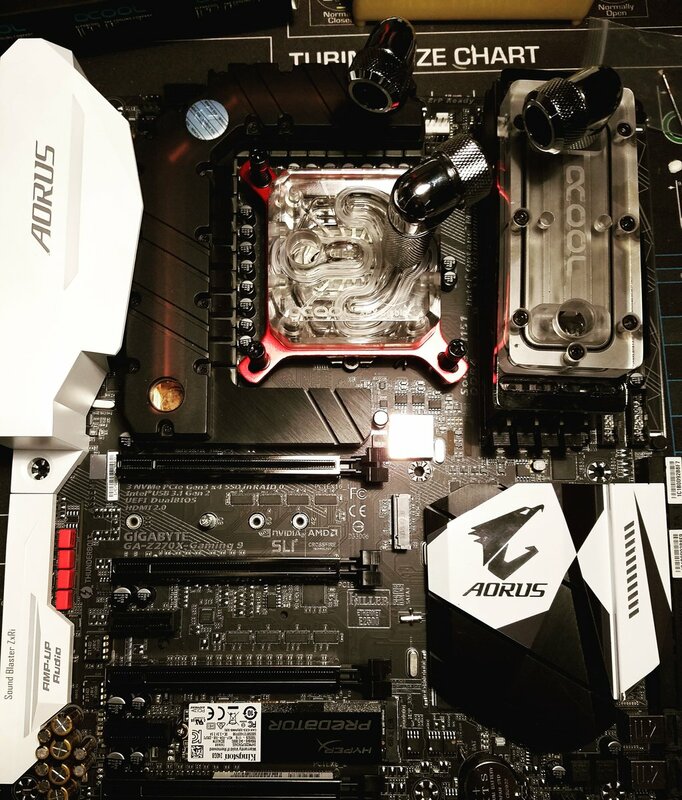 One of the main reasons I decided to go this route was the built in water block that comes on the Aorus Z270X-Gaming 9 motherboard. The combination of the ram, CPU and motherboard blocks looks really sweet with a good layout. 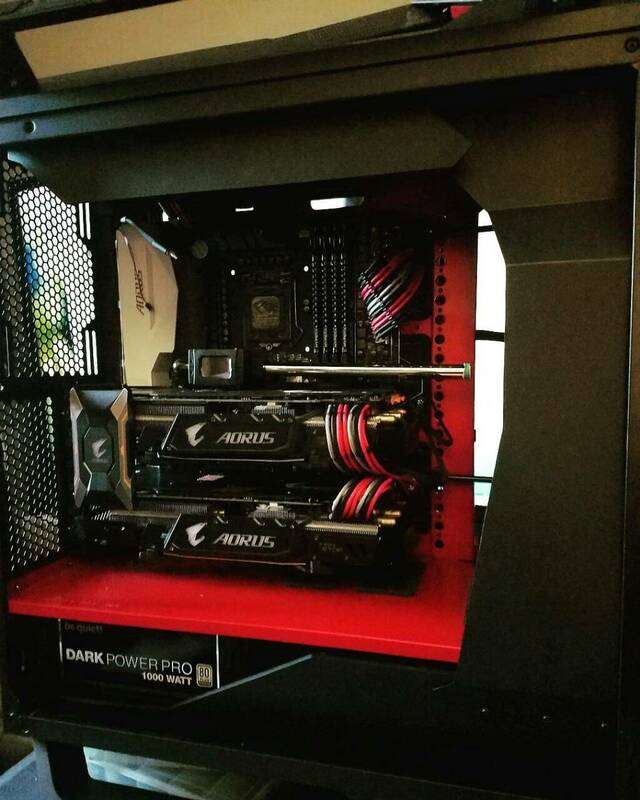 I still have one more HyperX ram stick to mount but I took a picture so you can get an idea of what it'll look like. After the excitement of unboxing the water cooling for this build I decided to put in the radiator fans and Reservoir. 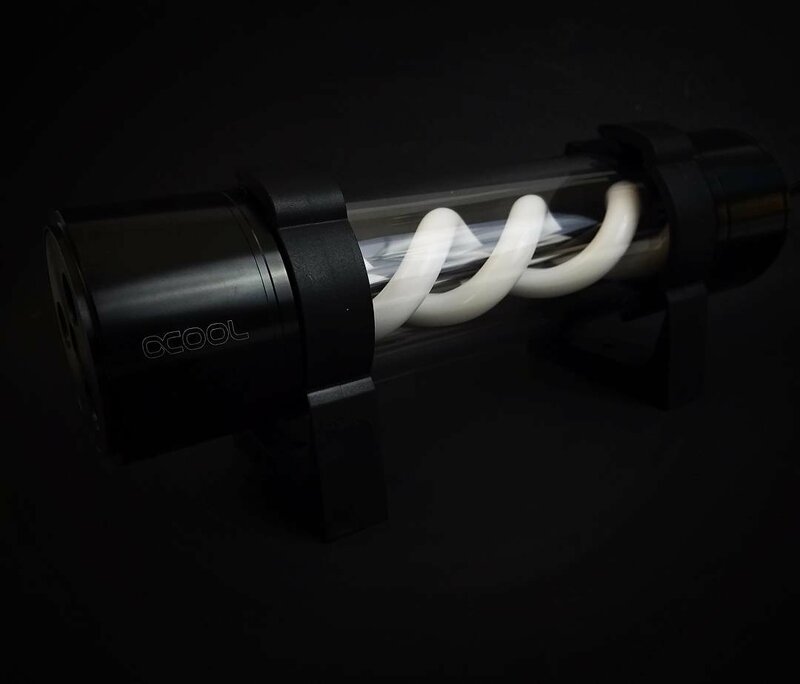 As you can tell I'm using the new Helix reservoir from alphacool. Once I went to put everything in I quickly realized that the reservoir was about 14 mm to wide. 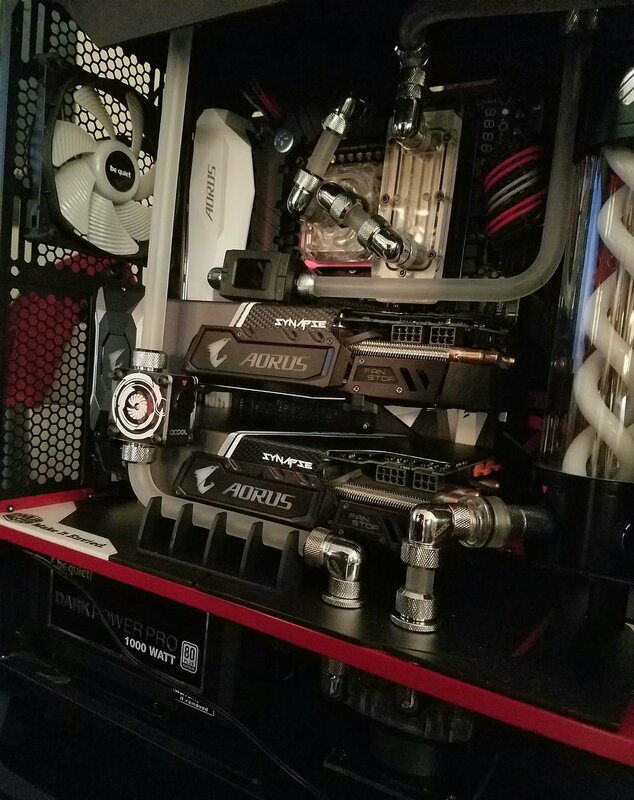 This wouldn't be a problem for most people but I decided to mount the reservoir on the radiator as well as using dual SLI Aorus gpus which are beefy in their own right. I didn't want to give up my reservoir location or anything else so I was left stuck with wondering what to do. Really my only option was to get a smaller radiator or try to figure it out. 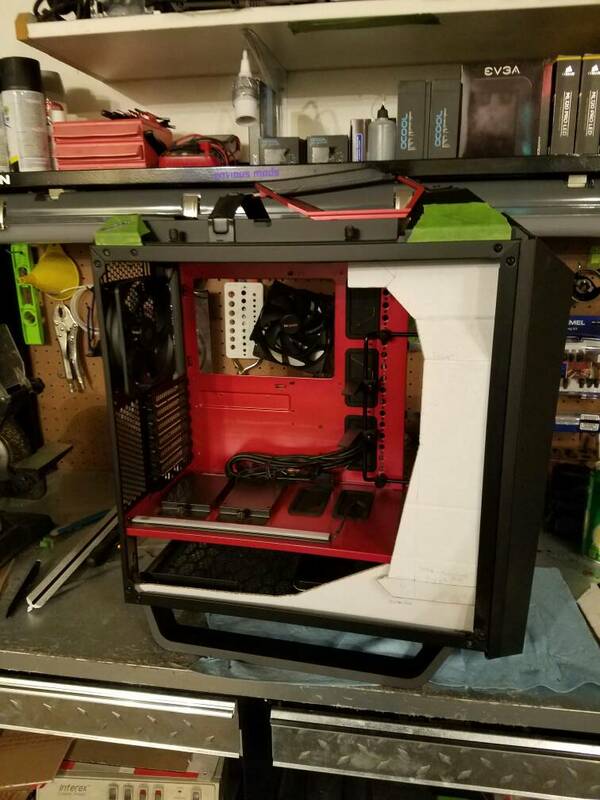 After taking a handful of measurements I realize that I can start cutting on The Cooler Master 5T and make room to move the radiator or the fans were. I had to remove all of the front grills as well as cut out part of the bezel and the metal lip across the front lower portion of the case. Once I had this cut out I was able to slide the radiator in with only a little bit of space to spare. 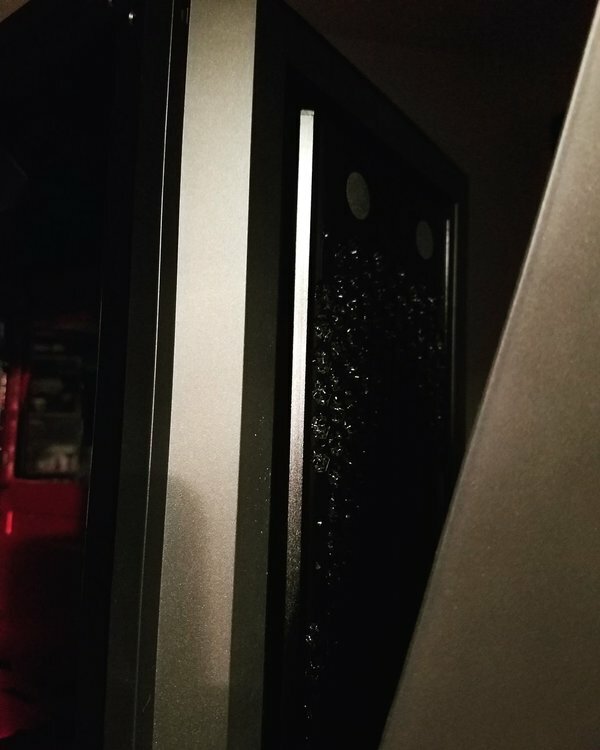 I then mounted the fans and the reservoir and to my amazement I now had about 15 mm worth of space between the graphics card and the reservoir. 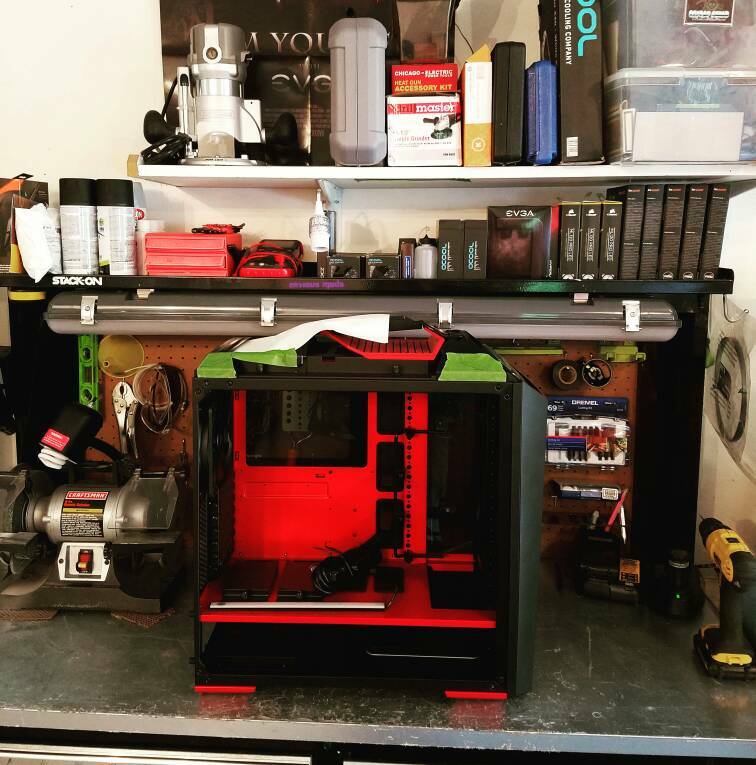 Being a case modder is essentially being really good at problem solving. We tend to want our cake and eat it too. I could have left the basement as is in the Cooler Master MasterCase 5t because it's very functional. 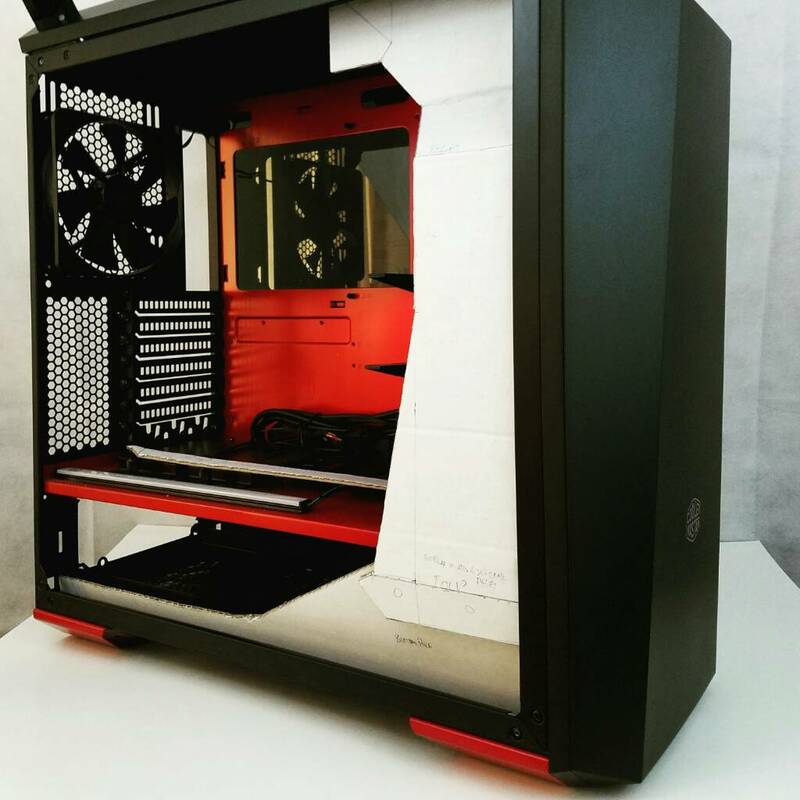 This build is one I didn't want to have any restraint while building and modding so I decided to make custom hand cut acrylic panels. I made templates to make sure everything cleared the inside. Once I had the templates finished it was time to figure out my passthroughs. I needed one pass through to go from the reservoir to the pump in the basement and from the pump back through another pass through to the radiator. This worked out great using the inlet and Outlet on the side of the pump. I highly recommend using a step drill to make holes big enough for pass through fittings as they don't tend to chew up metal or acrylics like most real bits will. I also decided to run the reservoir drain out the bottom far side. 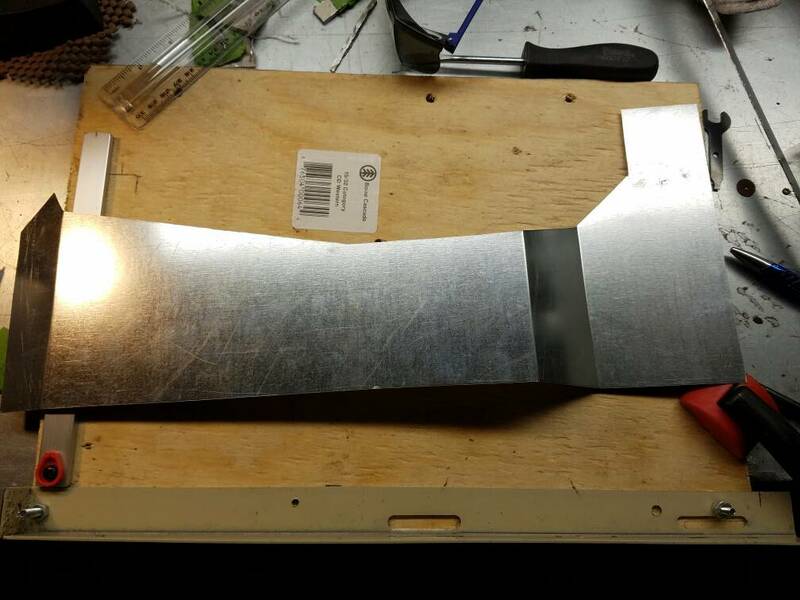 Later I'll be making a partial shroud which I can mount a passthrough fitting on for the drain. 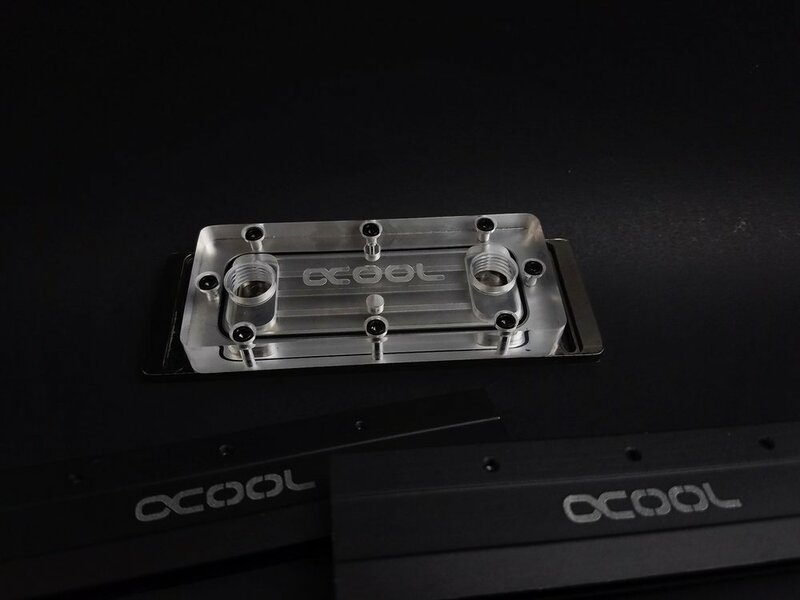 I wanted to start with the most difficult part of the watercooling loop. This would be the pass through to the pumps. Due to the tight space I had to use several different fittings to connect to the pass-through. Once I have these all marked out I could drill the holes using a step drill bit. I then started planning my loop and bending tubing. I decided to freestyle bend all of the parts of this loop. I now have the vast majority of it completed but it still needs a little fine-tuning. I'm very particular with angles and length of tubing so I will go back and take a few millimeters off or add a few millimeters of tubing where it's needed in order to make it exactly what I want. Before I even started on this I knew it would be rather tedious hand cutting, filing and sanding all of the acrylic needed to make this top piece. It has all come together really well though and is definitely worth the time spent. 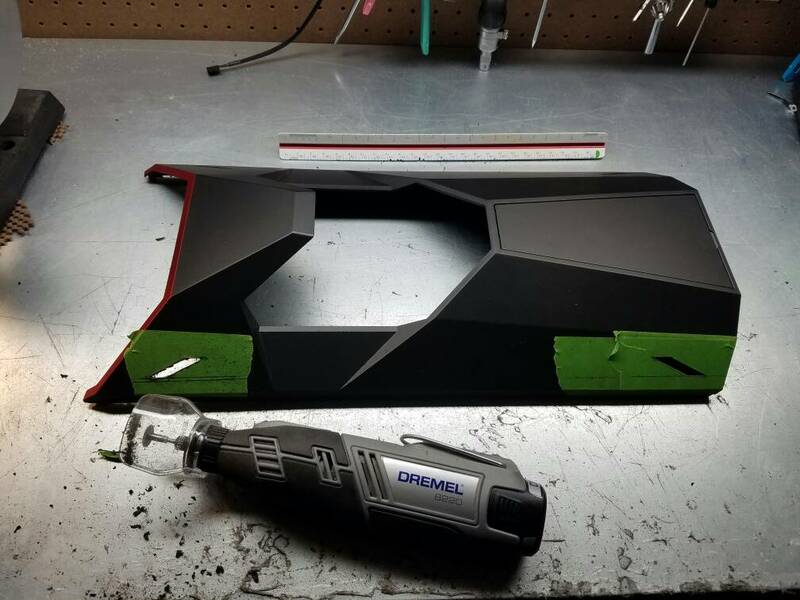 Once I had all the major pieces cut sanded and prep for paint I could start gluing them to the base piece that I had bent to match the top of the Cooler Master MasterCase 5t. To correctly place each piece of acrylic I had to draw lines on the base piece and then take detailed measurements as I glued them together. Once I had all that complete I had to paint the entire piece black. When the paint cured it was time to add The white strip to the top to complete the piece. This piece is a major part of the overall look so I wanted it to be exact. 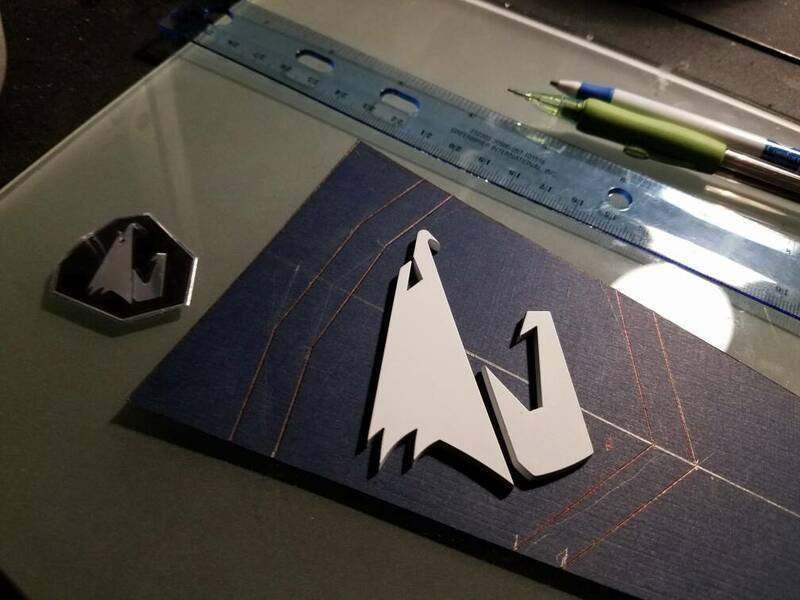 I wanted to make some custom GPU backplates for this build. 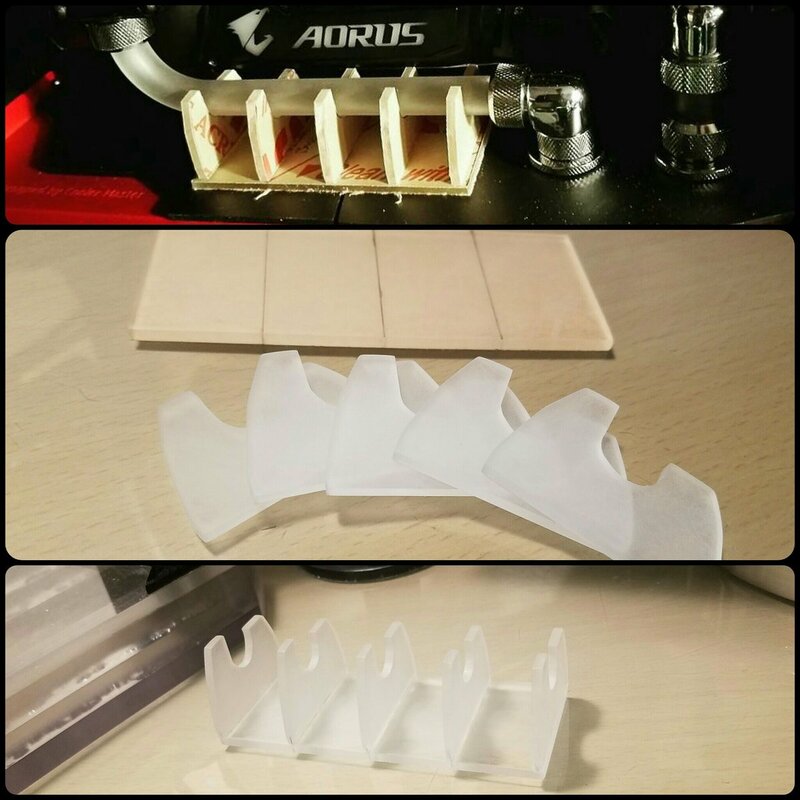 However I didn't want to make the typical backplate that you usually see on builds. 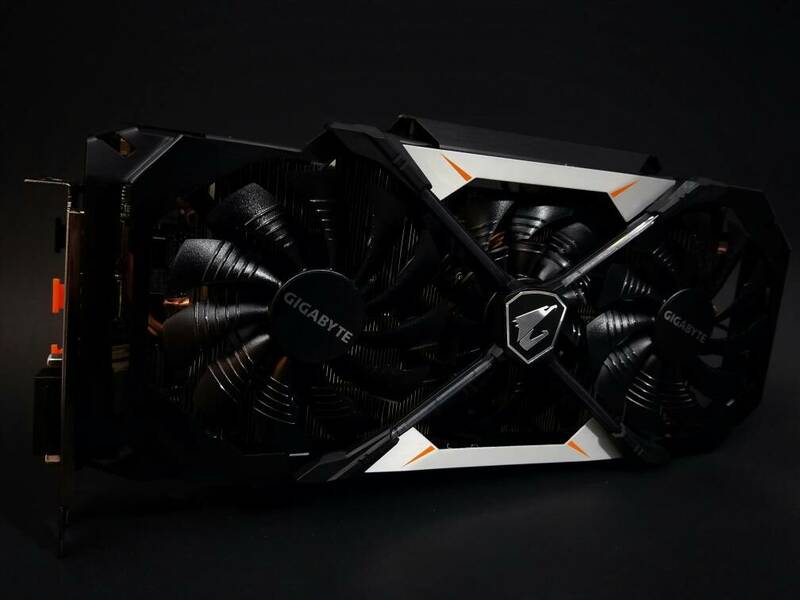 I decided to design one that wrapped around to the front of each graphics card and followed the Contours of the front plate. 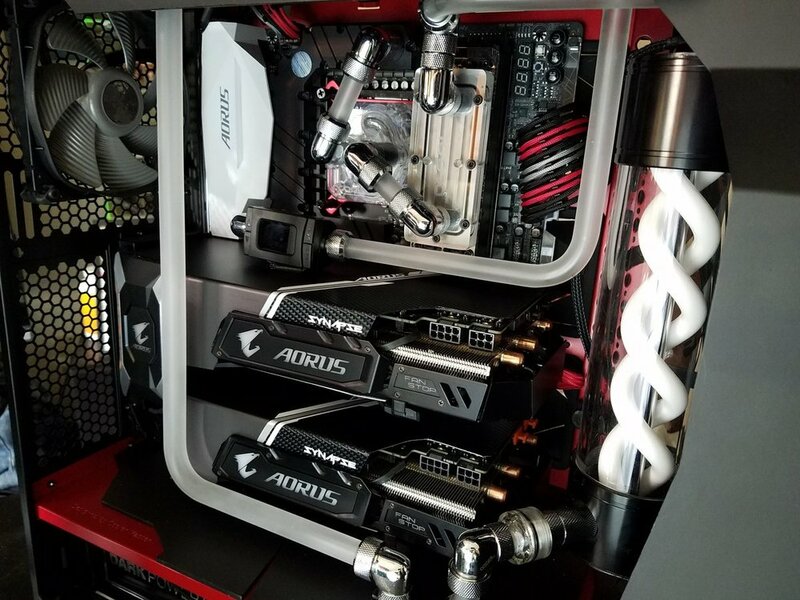 This was extremely tricky to do because of all the angles they use on this graphics cards coolers. Using hard stock I managed to refine a template that perfectly fit. 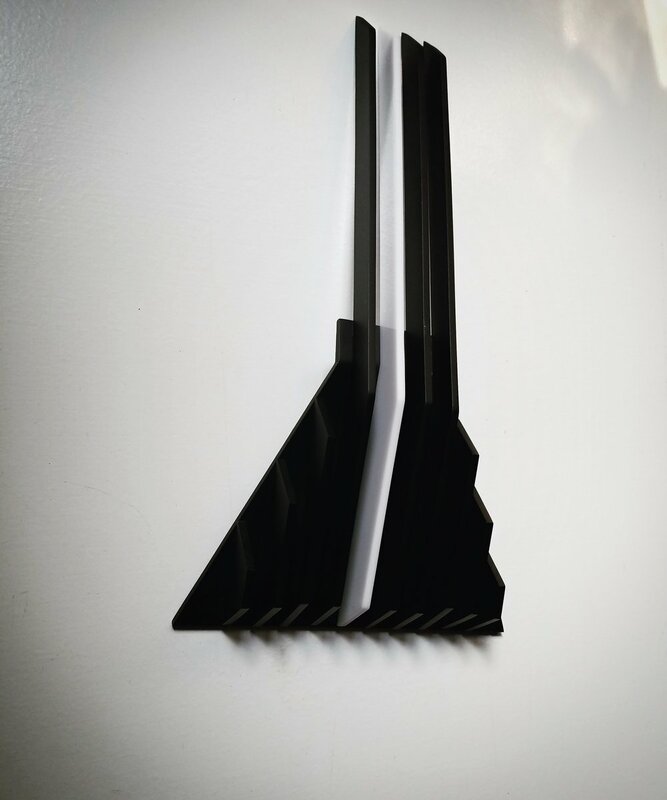 Now I couldn't make it out of acrylic because of the thickness would be too much for my design so I decided to make it out of metal. Bending it was rather tricky due to the thickness of the metal but I managed to get a good solid clean Bend all the way across. 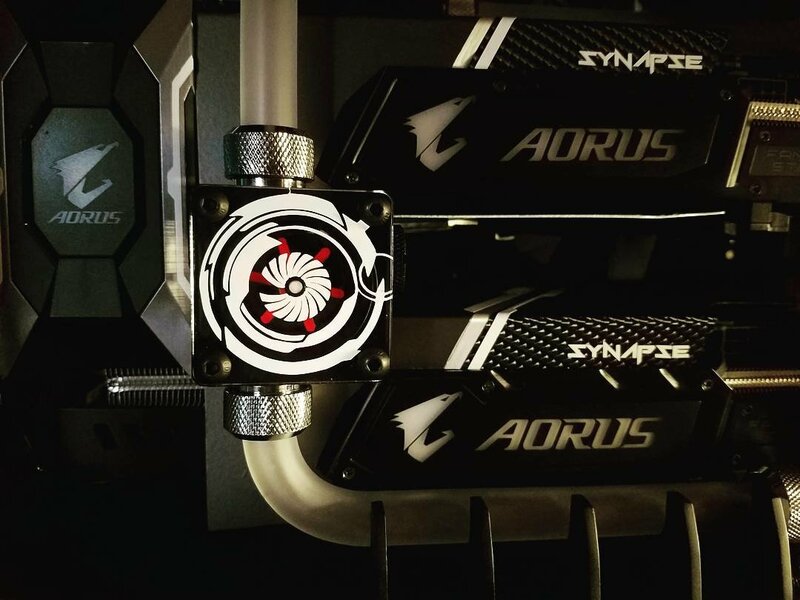 Once I had all that done I used several different kinds of vinyl to cover the GPU backplate and added a SyNAPSE logo to the front and in Aorus logo down the middle. These came out even better than I could have hoped. 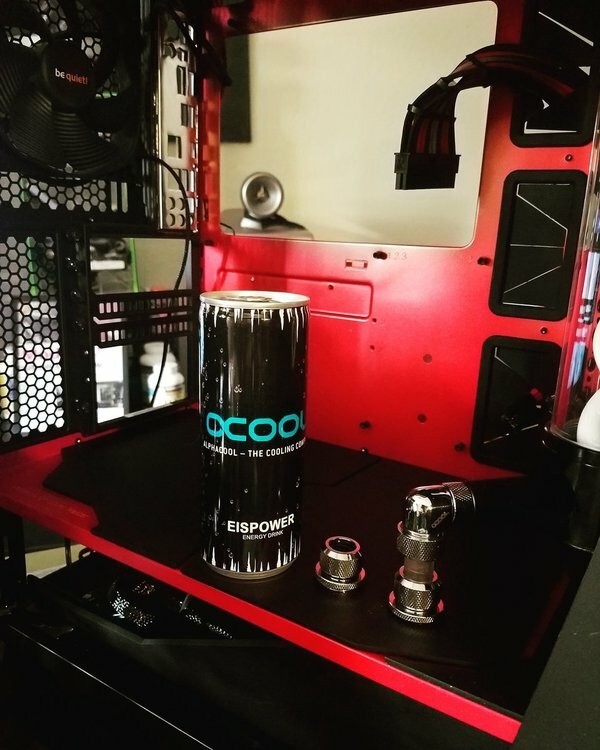 Usually installing a flow gauge is pretty quick and simple but on this build it took a lot more effort. I didn't want to interrupt the flow of the hardline layout or block anything in the build with the flow gauge. 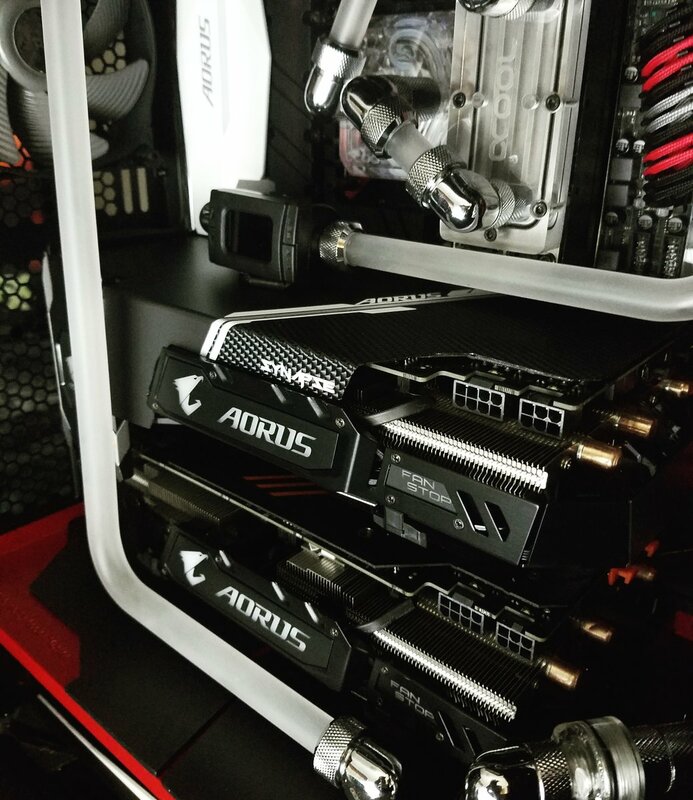 So I ended up finding a spot that would exactly fit the flow gauge between the two Aorus graphics cards. I tried to see what it looks like with and without the gauge to determine which way looked best. I have to say that after the mods it definitely fit in perfectly with the theme. I changed the spinner on the inside to read and added some custom vinyl work on the outside of the gauge. I decided to make this piece because I really wanted to make something that was different and new. This cool little system I created helps perfectly to support the hard-line tubing and it fits the bill exact. It took quite a bit of time to hand sand and file each one of these pieces to be an exact copy of the next. It was well worth it and came out even better than I could have hoped. 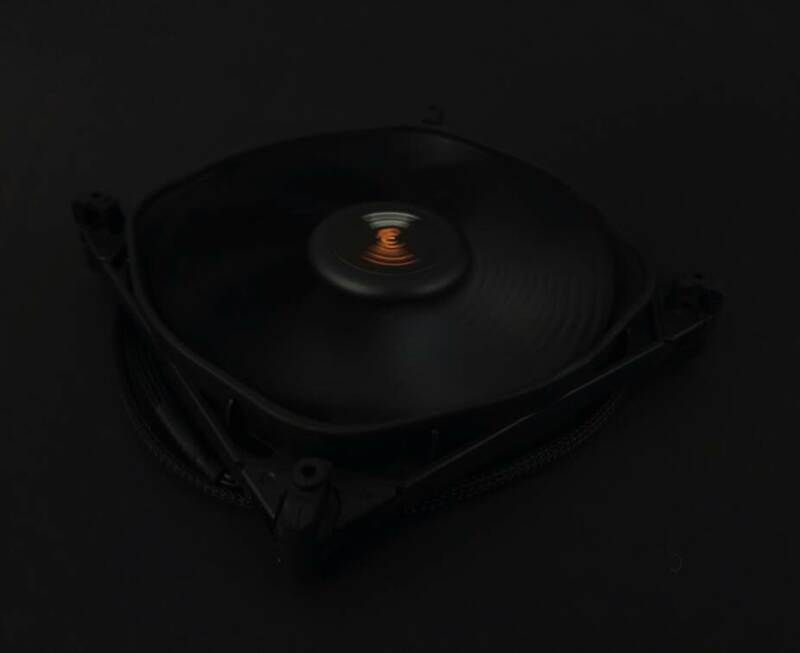 I wanted to use a 120mm Be Quiet fan for the rear main because they run very quiet and look clean. However I also wanted to dress it up a bit. I've found you can paint the blades by popping them out using even pressure from the back side. You have to be real careful not to put too much pressure on one blade or you could break it. I also tape off the insert and ring magnet so that it doesn't affect the balance. 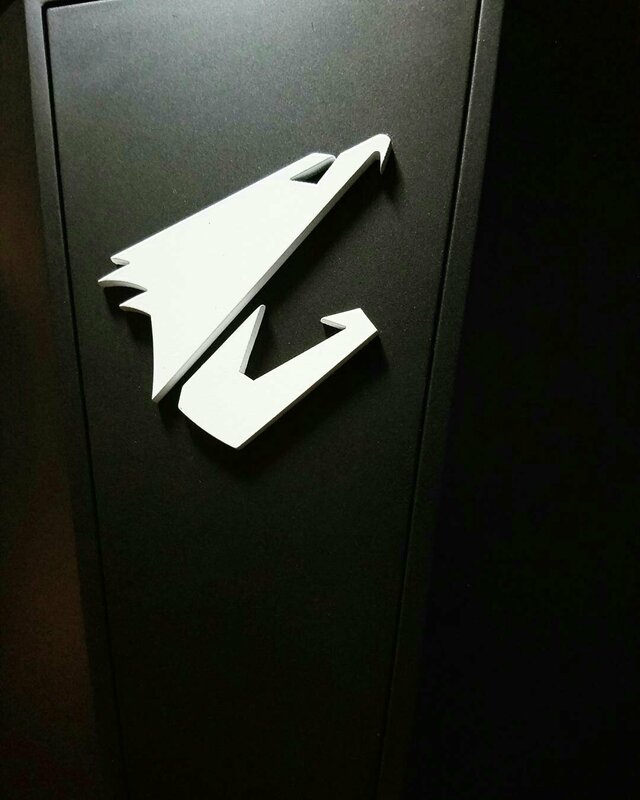 I went with a darker gray on the 1st fan and a lighter grey on the 2nd one. The lighter color definitely fits in the best. Since I had to remove the Be Quiet badge to paint I decided to make a new one using a black chrome backing and white lettering. 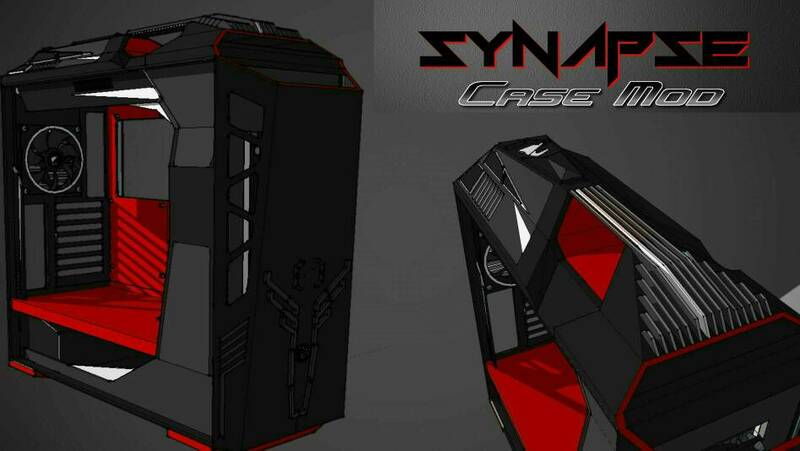 The SyNAPSE case mod will get a few changes in preparation for CES 2018. 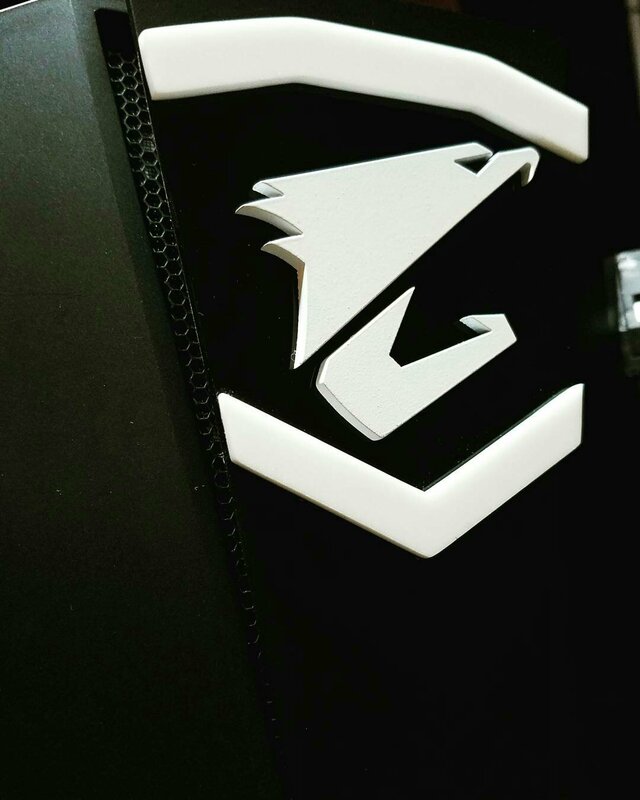 It will be displayed in Gigabyte and Aorus’s booth. 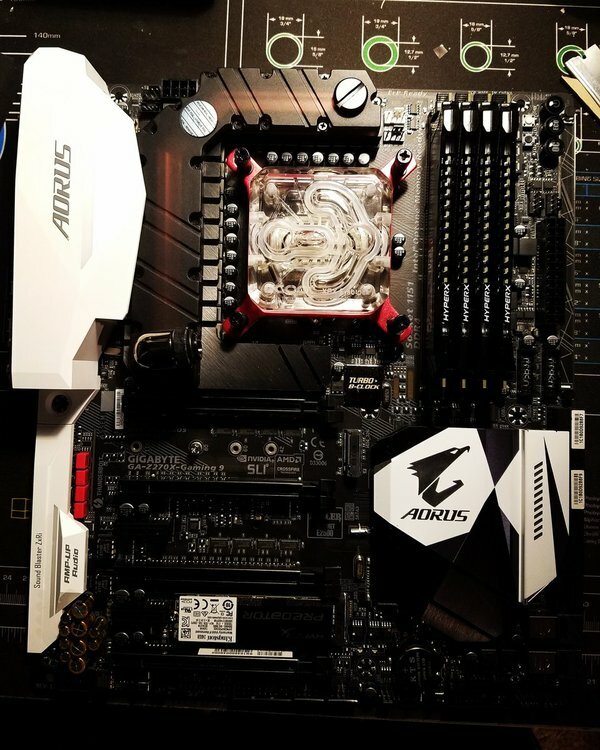 I've already swapped in the new Aorus Z370-Gaming 7 motherboard. Timing for this fit very well. 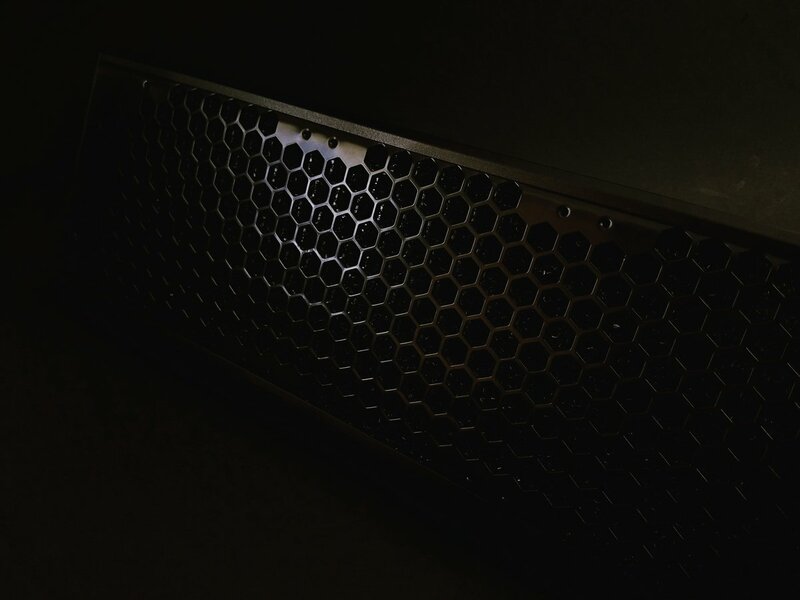 I will continue to update the build log but, some parts of the build will be saved until it's unveiling at CES. I will also have another build displayed with two other manufacturers. You will have to wait until CES to see any progress on it though. 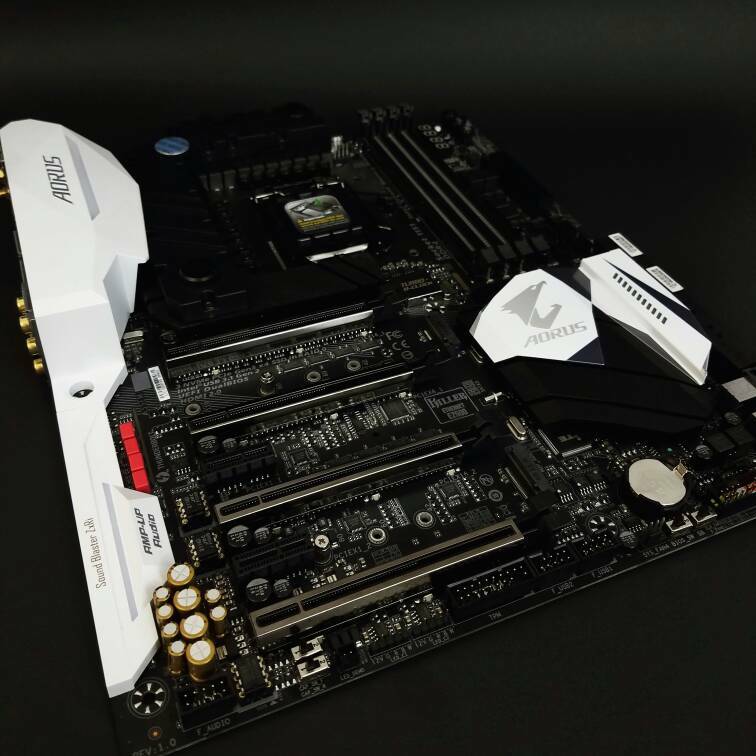 The design styling of this motherboard is dead on with my natural building style. I've actually been asked a few times if I helped design it. 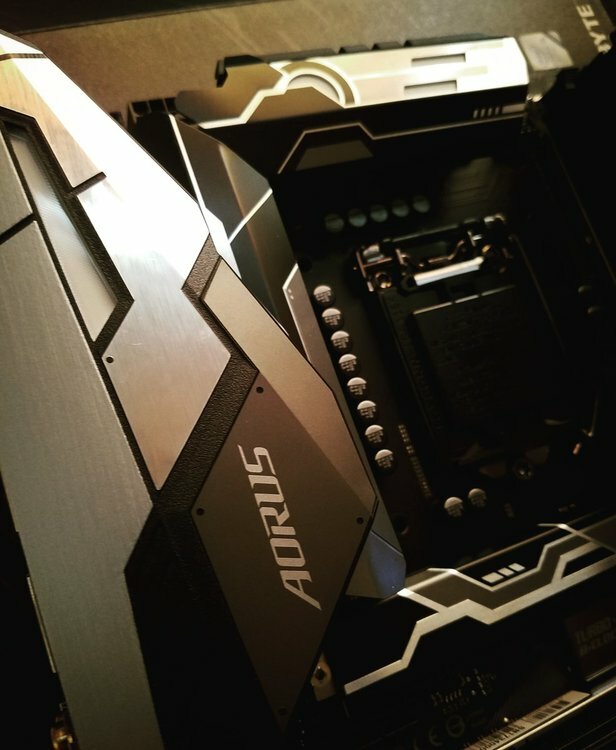 I love all the new features as well as the look and feel of the new Aorus motherboard. Here are a few shots of the new motherboard as well as some with it mounted. I had to redo part of the loop to accommodate the new motherboard. However I wanted to keep the long thought out run design of the hardline. I made sure that it was almost exactly the same as the previous design. The new motherboard will also use the new i7 chip from Intel. 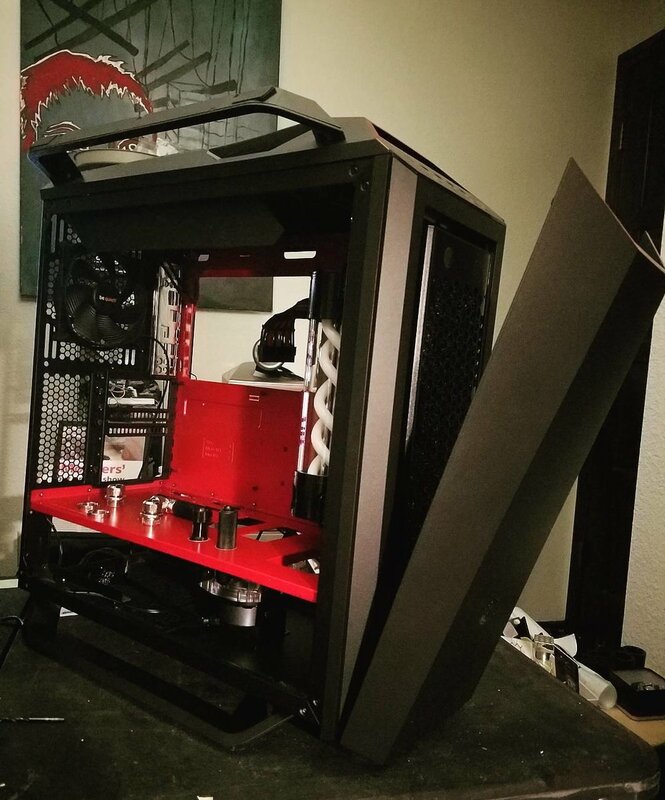 As many of you noticed, I had to take a break from the SyNAPSE Case Mod due to getting it and another build ready for CES 2018. This included doing the finish work, swapping out some of the hardware and prepping it to be shipped. 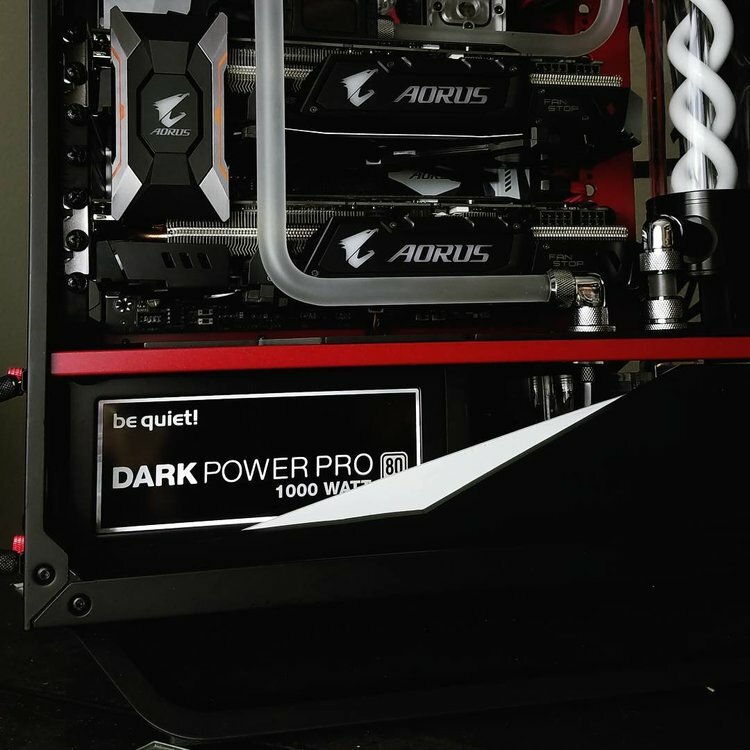 Now that it's complete I can share the new specs and final pictures of the project. This build was a massive success at CES and I can't think Gigabyte and Aorus enough for proudly displaying it during the show. 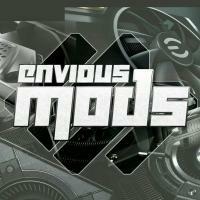 The feedback from the community and enthusiasts was better than I ever could have hoped for. Thank all of you for your constructive criticism, comments, and support! Now let's get to the new specs!